When it comes to construction or maintenance projects, Hammaker East understands the importance of quality materials. 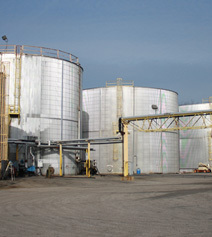 From hot mix asphalt plants and asphalt emulsion plants, Hammaker East manufactures asphalt emulsions and asphalt mixes for distribution to various government agencies and private contractors. All Hammaker East manufacturing plants are DOT certified with state approved, portable trailer-mounted plants to give us the ability to produce cold mix asphalts on any job site in the region. In addition, Russell Standard Laboratories,a sister company, participate in ARML testing, with ASSHTO certification to ensure that our products meet or exceed all industry requirements.